In keeping with a neat trick garnered from Mary K Greer in her excellent book, Tarot Constellations, Patterns of Personal Destiny, I have now calculated my personal ‘Year Card’ for 2014. This is a technique used to gain insight into the energies, opportunities, and events in store for me in the coming year. 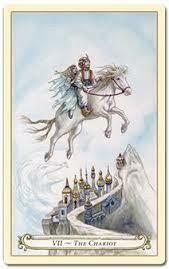 The result corresponds to the number of the Major Arcana representing my personal coming year. The Chariot Year focuses on my goals (to be a succesful novelist), so it’s time to harness my writerly energies to move forward. Since I’ve recently finished writing a fantastic new novel (The Curve of Capricorn), I will continue my push for finding a good agent who will help me get to publication and beyond. Because the number 7 signifies initiation, this is a year for me to master my abilities especially in regards to handling difficult situations, often with conflicting aspects (I suspect marketing/selling a novel will be a good deal harder than it ought). I will need to work on self-control and self discipline. If I give free range my instincts and emotion (represented by the sphinxes): they may tear me apart. This could be experienced as something of breakdown (losing my temper or worse) or an accident (hopefully not literally actined out in my car/chariot). OK – I promise to be good! The moons on the shoulders of the charioteer signal a need to champion a cause. I love astrology so much, that won’t be a problem and I sincerely believe that the (Capricornian) themes (including abuse of power, ruthless ambition, rabid materialism) I’ve explored in The Curve of Capricorn are of huge importance not only to my fellow Americans, but to the world at large. I must be assertive in establishing my identity (as a novelist) in the world while at the same time avoiding running roughshod everyone else. 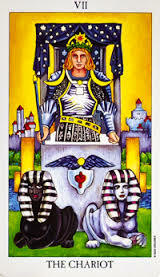 Because the Chariot is a card of triumph, success and good health, I suspect 2014 will be a good year for me as long as I keep firm grasp on the reins. Relax. Close eyes. See strong, white light surrounding me, making my body appear radiant with energy and physical health. I feel myself strengthened both within and without. I visualise myself accomplishing my goal, thanking my supporters, and accepting all and any adulation that may be due. I know that my willpower and determination will lead me to victory. Next article Is your heart still in what you’re doing?